The Siena model features a wonderful master suite and a guest bedroom/office/den. The open floor plan allows abundant natural light & great circulation. High ceilings, granite countertops, hardwood cabinets, walk-in closet & pantry, a spacious kitchen island, refrigerated A/C and energy efficient performance are just a few of the fine living features. Your kitchen includes a Kitchenaid Stainless Steel appliance package. A portal covered patio accessed from the dining room accommodates outdoor living with views to the Sangre de Cristo mountains! Villas di Toscana is a gated community of patio homes ideal for full or part-time residency with paths, small parks, and open space. 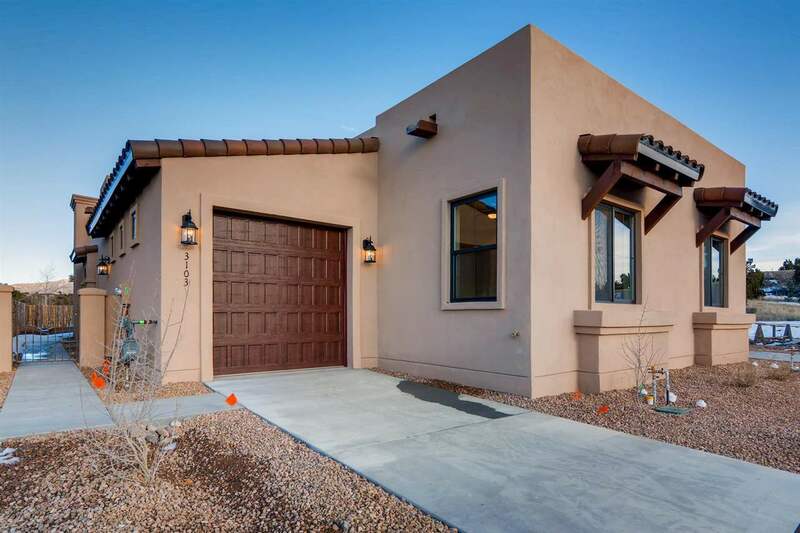 Centrally located, the neighborhood is just minutes from all that Santa Fe offers. Welcome home to Villas di Toscana! Directions To Property: South To Cam Carlos Rey To Gov. Miles- Make Left And Then Go To Eastern Most Gate. Extras: Cable TV, Cooking - Gas, Garage Door Opener, Insulated Windows, Landscaped, Satellite TV, Sprinkler/Drip Sys.